Are your gums receding? It can be extremely scary to know that you suffer from gingival recession, but you must stop worrying and take action. There are several treatment options available for individuals facing this dental problem. We will discuss more about this process in which the gum tissue pulls back, exposing more of the teeth. Furthermore, we will also share a number of effective natural remedies that can stop this issue from occurring. Receding gums is a term given to the exposure in the roots of our teeth. This is due to the loss of gum tissue. As a result, pockets in the gum can also expose the bone that is holding the teeth in place. Infection may occur, and teeth can become loose and eventually be lost. Gum recession is a common dental problem that mostly affects adults over the age of 40. However, teenagers and even children around the age of 10 face the risk of developing this condition. Periodontal disease is the number one cause of gum recession. This is because patients suffering from gum disease suffer from tissue destruction resulting from the gradual loss of bone. This leads to apical gingival migration and, consequently, root exposure. If you have periodontal disease, then you may have your gums receding because of the periodontal treatment. The different methods used to cure this condition imply a significant loss of tissue due to the severity of the case or the surgical procedures performed. Procedures such as curettage result in a decrease in the gingival volume. Patients are often worried about the outcomes of such treatment options, as periodontal inflammation can ensure coverage of the cervical region of the teeth. Chronic trauma is a risk factor for receding gums. This is a particular issue caused by inappropriate brushing that physically harms the gingival tissues. Applying too much pressure when you are cleaning your teeth with a toothbrush can traumatize the delicate gum margins. Doing so on a daily basis has the potential of gradually leading to gingival recession over the course of a few years. Just as the rest of our body, the characteristics of our gums are also determined by genetics. If one or both parents have receding gums, then the child will face a higher risk for this condition as well. Bruxism, the medical term for teeth grinding and jaw clenching, is also a possible cause for gum recession. In fact, this habit may be a triggering factor for other dental maladies such as jaw joint disorders, enamel wear, teeth fracturing, and more. A sign that you may suffer from bruxism is waking up in the morning with a headache. Consult your dentist on the various methods available to treat teeth grinding. A mouth guard may be a good starting point. Cleaning your teeth in an inadequate way, either through brushing, flossing, or rinsing with a mouthwash, may lead to plaque buildup. As it hardens and turns into calculus, it can develop into gum recession. Women are also affected by fluctuations in estrogen, progesterone, and testosterone levels. This mostly happens during puberty, pregnancy, and menopause. Hormonal changes can make the gums more sensitive, thus more vulnerable to gingival recession. People who have crooked teeth (or a misaligned bite) are more prone than others to gum recession. This is due to the fact that the crooked teeth misaligned teeth put too much pressure on the gums and the bone. Your gums receding may be a consequence of using tobacco. Both smoking tobacco or opting for the smokeless kind can cause gingival recession. The reason lies in the fact that smoking this product causes the tissue to lose blood supplies. Because of this, there is a real possibility of developing secondary gum infections that can cause tissue loss. Smokeless tobacco is in no way safer. Dipping tobacco physically irritates the sensitive gum tissue because of the glass particles in the product. Repetitive use of tobacco will have the tissue recede from the areas where people usually hold the dip. While there may not be any discomfort associated with lip or tongue piercings while wearing them, the repetitive rubbing against the gum tissue may cause gradual damage. Chronic irritation due to lip or tongue jewelry can cause the soft tissue to shift out of place, thus exposing the tooth. Even if you don’t experience any tenderness in that area at the moment, piercings should not be worn every day. Your teeth are longer than usual. Tooth exposure is a consequence of gum tissue receding. Your roots are exposed. If the root of the tooth becomes visible, this is a clear sign that you must schedule an appointment with your dentist ASAP. It will lead to further damage, decay, and pain. You have a notch on the tooth. Also known as abfraction, this term explains the loss of structure in the tooth that is caused by non-carious cervical lesions. It occurs along the gingival margin, appearing in three shapes: saucer, wedge, or mixed patterns. You are sensitive to foods and drinks that are hot, cold, sour, or spicy. You may notice that the spaces between the teeth are wider. While it may not be true, the spaces do seem larger because your gums cannot cover them any longer. If they are indeed wider, then you are facing an even bigger problem because the bone and other support structures in the jaw may be eroding. You have cavities below the gum line. As the bone is lost, it leads to the formation of periodontal pockets. These gum pockets get filled with bacteria that cause infection and destroy the bone. Other symptoms that should have you call your dentist or periodontist are: purple-red gums, swollen and shiny gums, bleeding when brushing or flossing, and bad breath (halitosis). These are signs that you may suffer from gum inflammation. If left untreated, it will cause further problems that will ultimately lead to gums receding due to periodontitis. 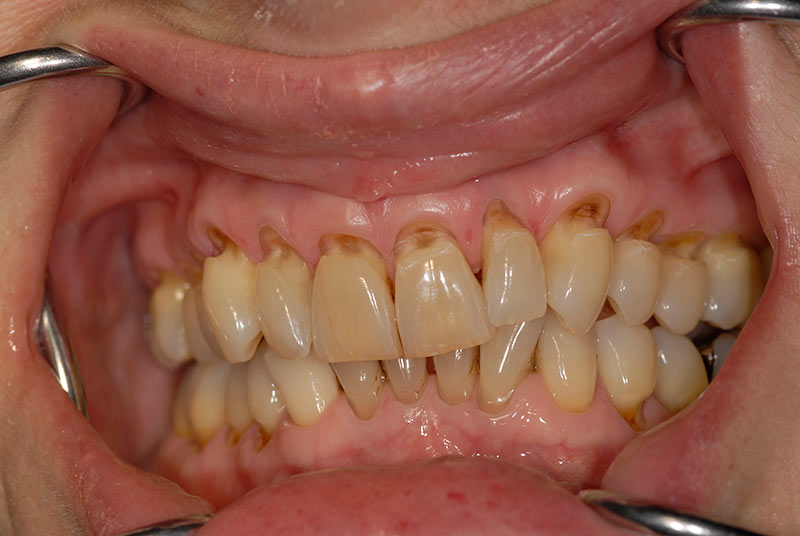 Can you reverse receding gums? – most patients ask. We are frequently questioned whether gums receding can grow back. Sadly, the answer is no. You cannot simply grow back the tissue, but you can try your best to stop the recession from getting worse. While you can never recover what has been lost, you can find relief in the natural methods that have been proven to improve the condition. Sesame oil is rich in linoleic acid and palmitic acids. It is the linoleic acid that offers it antibacterial and anti-inflammatories properties. Furthermore, it is also full of essential minerals such as calcium, manganese, magnesium, and copper. You can use sesame oil the same way you would with a mouthwash. It is perfect for removing toxic substances from the teeth and gums. It can also help with plaque buildup, which is a cause of receding gums. Take about a quarter cup of organic oil and rinse your mouth thoroughly with it. Coconut oil is another powerful antimicrobial tool for many conditions, including the causes behind gum recession. Lauric acid makes up for almost 50 percent of the oil. This acid can kill harmful pathogens, including bacteria and fungi. Because of this, it is recommended we swish coconut oil in our mouth after brushing our teeth as a way to optimize our oral hygiene practices. This powerful anti-fungal and microbial agent is capable of both destroying bacteria and diminishing plaque buildup in the teeth. Diluted tea tree oil is used with great success to prevent receding gums. It is important you dilute the oil before using it because it can cause burns to the tissue. Another great antiseptic and antibacterial agent, lemon oil has many qualities that can benefit your dental health. Unlike coconut and sesame oils but just like tea tree oil, it has to be applied in its diluted form. Otherwise, it can corrode the enamel of the teeth. Lemon oil can be purchased from the store, but you can also prepare it at home. You can make it by infusing olive oil with lemons for a couple of weeks. This essential oil packs anti-inflammatory properties that can also help with swollen gums. Eucalyptus oil can kill all the germs in your mouth and prevent tooth decay and diseases that affect the gum. Getting rid of the cases of receding gums will help you both prevent and ameliorate the symptoms of the disease. Always dilute this oil. Place a few drops of eucalyptus oil on the tips of your finger and gently massage your gums for a few minutes. Afterward, rinse it off with water. In addition to these organic remedies for gum recession, it is mandatory you take other actions as well. Establish regular good oral hygiene habits, reduce the quantity of sugary products you consume, make sure you eat foods rich in nutrients, quit smoking, lower your alcohol intake, and avoid drinking carbonated soda. Gums receding is a serious issue and you must look for warning signs. If you fear you might have this condition, consult a specialist right away. There are various treatment options that your dentist may recommend. Such methods include laser therapy, soft tissue grafting, and pocket depth reduction, among others.